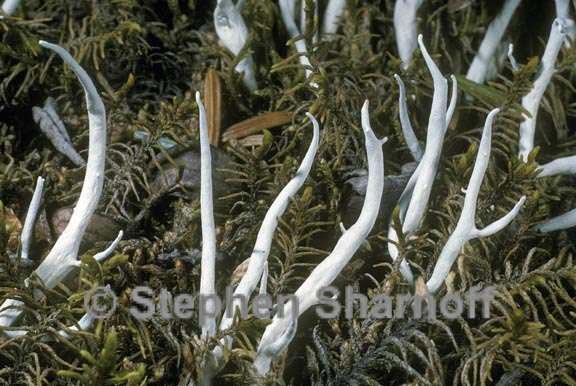 Thamnolia subuliformis (Ehrh.) W.L. Culb. Thallus as in the following species, of erect, simple to sparingly branched, pointed, cylindrical podetia which are white but do not change color or stain herbarium paper on long standing. Reactions: UV+ yellow, K— or pale yellow, P+ yellow. Contents: squamatic and baeomycesic acids. This species, like the following, grows on many types of tundras but is more common than it in the more sheltered localities. It is used by the golden plover in decorating its nest sites (Sauer 1962). It is both more abundant and more wide ranging than T. vermicularis in the northern hemisphere where it is circumpolar. In the southern hemisphere it is rare.